Serenji also bundles a free edition of our Deltanji source code management tool. Read more about Serenji at https://georgejames.com/serenji or use the Extensions view in VS Code to find and install it. We look forward to your feedback through this Developer Community article. Will this require a new Serenji license for the debugger or will the existing one work? We have no current plans for implementing Serenji for VS. The architecture of VS is significantly different from that of VSCode. We just published 3.0.2. If you already installed 3.0.0 your VSCode extension should upgrade automatically next time VSCode checks for extension updates. Or you can trigger that from the "..." menu on the Extensions viewlet. For best effect you should also upgrade the server-side part wherever you've previously been connecting from 3.0.0. Upgrade embedded Deltanji to version 7.0. Support networked Deltanji Enterprise edition environments. Automatically add embedded Deltanji aliases for new usernames. Report permission problems at connection time. Support prompting for username at connect time. Remove 'Preview' flag from Marketplace entry. Serenji is also listed on Open Exchange. 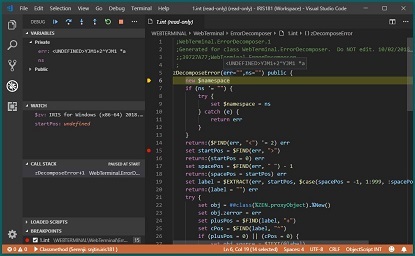 Is there documentation on how we can connect Visual Studio Code + Serenji with Cache? If you have VSCode then select the Extensions viewlet and type Serenji in the Marketplace search field. Then click on the first result returned (Serenji 3.0.2). In the right hand panel you will see Details about the extension including a section about Installation. Ask here if you have any more questions. Yes, I have Visual Studio Code installed and installed also the new Serenji 3.0.2. I can't figure out a way to connect to a Cache server. Let me check that link you posted.